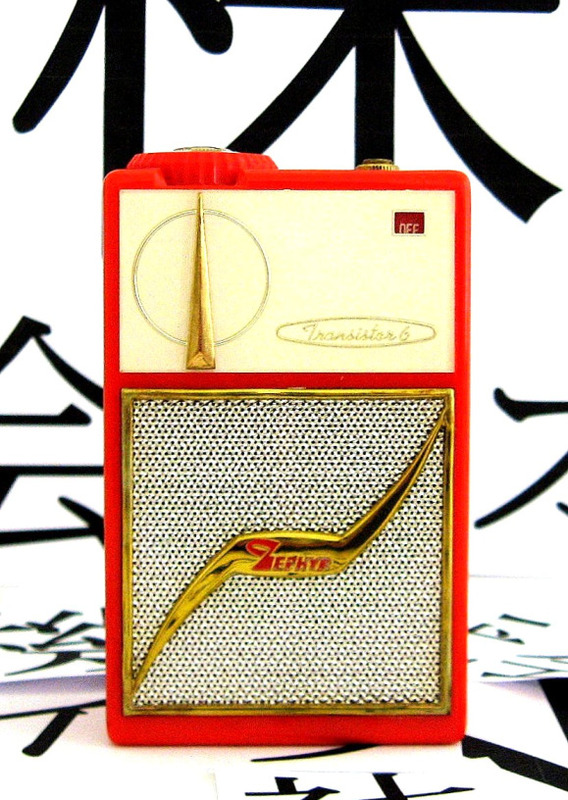 This marvelous Zephyr AR-600 was made by Aiwa (アイワ) circa 1958. 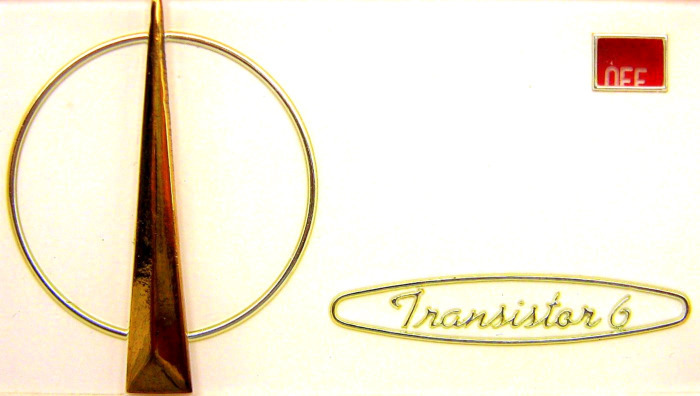 It is a stunning example of early Japanese transistor radio design! 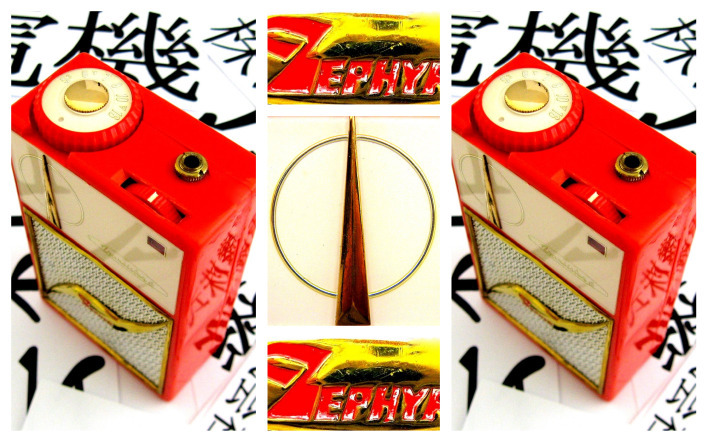 The standout highlight of this radio is the beautiful gold lightning bolt with the red Zephyr logo molded into it! 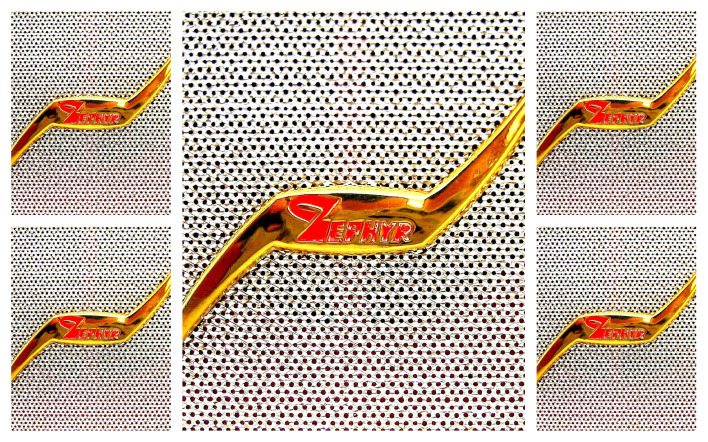 The Zephyr logo is written in a somewhat zany script. It also features an unusual top mounted, under-painted tuning dial. It has a delicate under-painted escutcheon above the speaker grill with a gold 'rocket like' dial pointer aimed valiantly at the sky - very very cool. Even the back looks classy with its vertical louvers to the side. These Zephyr's are made from very brittle plastic and I have yet to see an example that is not chipped. 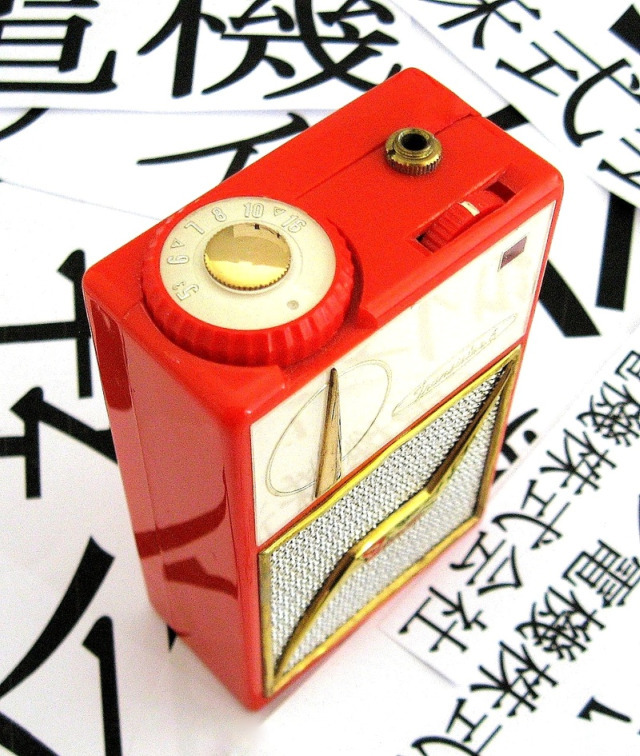 This radio and other top end Japanese sets give credence to one of the reasons that the Japanese came to dominate the transistor radio market in the USA - superior design! 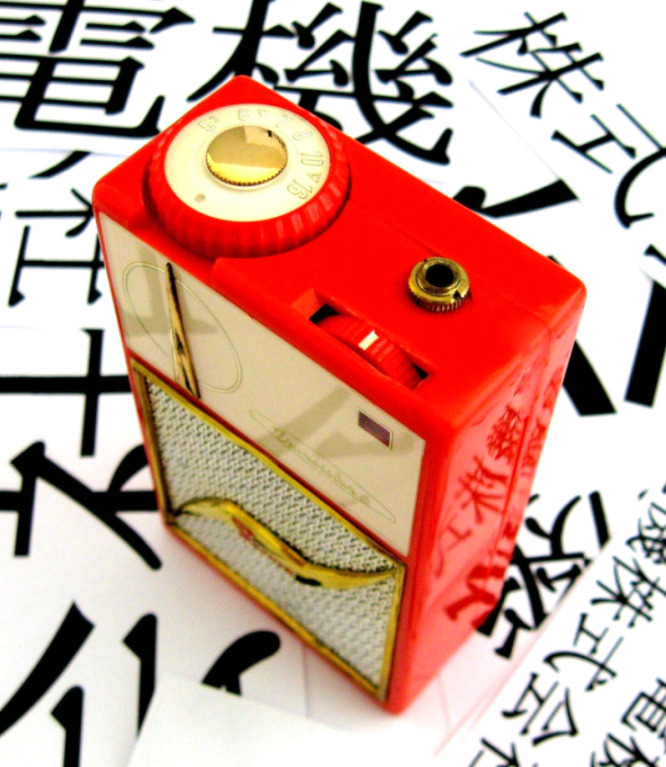 Aiwa was founded in June 1951 as AIKO Denki Sangyo Co Ltd a maker of microphones. In 1959 it changed its name to Aiwa. In 1969 Sony purchased a majority interest in Aiwa, which then became an affiliated company of Sony. Gobble, Gobble.... So is the way of the Corporate Giants....! I've seen this radio colored pink and also gray. 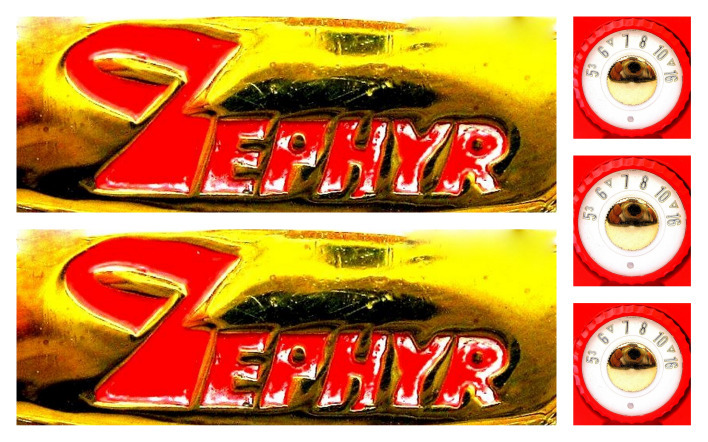 This Zephyr is also found branded as its maker. If Flash Gordon had a multi purpose Radio/Stun Gun/Walkie Talkie combo then surely it would look like this. I can just imagine him holding it up to his ear as he seeks cover behind a huge purple rock. Whilst speaking frantically with Dr Zarkov he hears a footstep behind him... WHAM BAM he does a triple backwards somersault and takes aim with his Zephyr AR-600 heroically blowing the sneaky Ming the Merciless to smithereens! Hell yeah!! Printed on the cicuit board is AIWA TRS-5901. 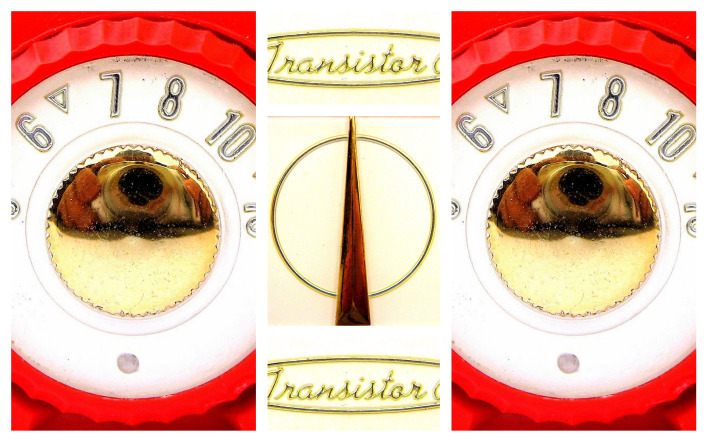 Collector and author Eric Wrobbel has a Packard Bell radio manufactured by Aiwa that has the same number printed on the circuit board. Eric's Packard Bell looks a bit different to this Zephyr AR-600 but the 'skeleton' of the radio appears to be the same with the top mounted tuning dial and earphone jack, vertical ferrite rod antenna and it even has the same vertical louvers on the back.